Watercolor ombre background flower card. Today, this ombre background watercolor floral card is up on the Unity blog as part of my Watercolor Wednesday series. This card was designed as a wedding, engagement or anniversary card. I made a video tutorial for it, focusing on the background ombre watercoloring. Supplies: Unity Stamp Co. Wild Florals by Holly Hoffman, Sakura Koi watercolor, watercolor brushes, Lil' Inker Designs die, Craftin Desert Divas sequins, Ranger watercolor paper and archival ink. 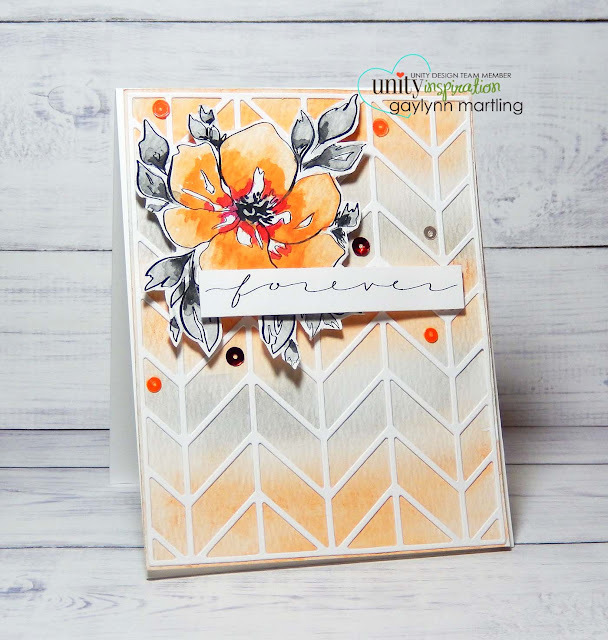 To read the entire article and details for this ombre watercolor flower card, visit the Unity blog. For more projects in the series, visit Unity's Watercolor Wednesday. Hello, Gaylynn here. Today is Thoughtful Tuesday on the My Creative Time blog. This card is great for any occasion, especially birthday. It works perfectly as a gift card or money holder. For this card, I used Ranger distress ink pads in two colors for watercolor. I added the color to a plastic craft mat, spritzed with water and then dipped watercolor paper onto the color. This process is one way of using ink smooshing. I used the excess colors for the feathers. It is always a surprise to see the outcome. It is never the same twice. Here is another look at today's watercolor feather card. Remember to visit Miss Emma's My Creative Time blog for more Thoughtful Tuesday creations. Love and kindness flower glitter card. The way I see it, you can never spread too much love and kindness. I really love this sentiment along with the newest florals from Unity. Sentiment: You spread love & kindness wherever you go. For this card, I used Copic markers for this gorgeous flower. I added a silver glitter die-cut panel as a backdrop for it and also a few sequins. Clean and simple (CAS) is what I intended for this heartfelt greeting card. Here is a quick video tutorial on this flower card process. This is another look a little closer. Supplies: Unity Stamp Co. Blossoming Beauty by Holly Hoffman, Copic markers BG15, BG0000, B0000, B01, G0000, YG95, G21, Y21; glitter paper, Elizabeth Craft Designs die, Pretty Pink Posh sequins and Ranger archival ink. Floral wine bottle tag with watercolor pencils. This is a decorated wine bottle gift tag. It is something pretty and simple to add to a hostess gift. Sentiment: Grow wild for a while. 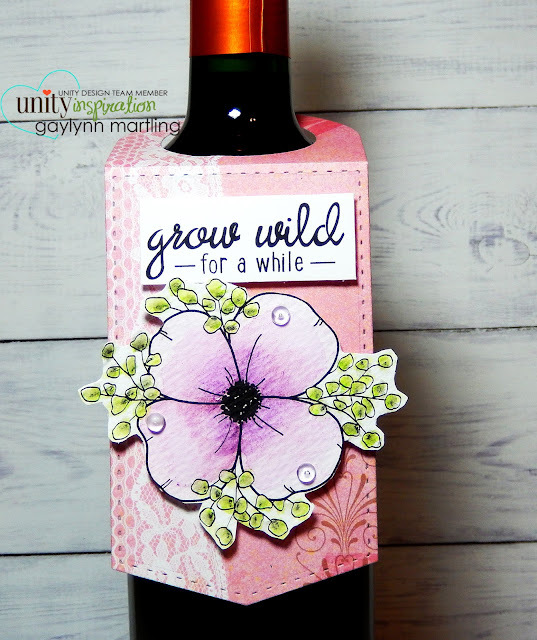 The sentiment inspired me to make a fun wine tag with the added floral accent. The tag was die-cut onto double-sided patterned paper. I used watercolor pencils for the flower color. 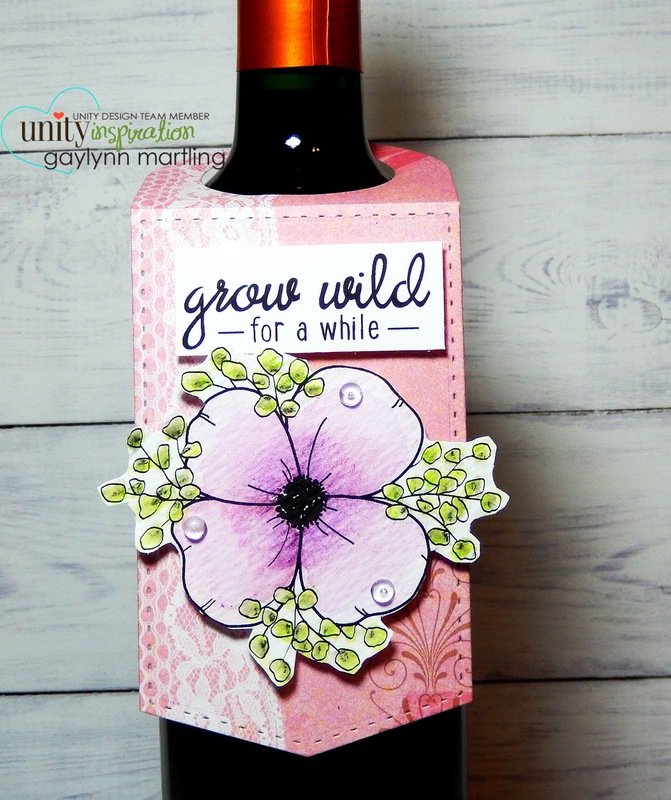 I made a quick video tutorial for this floral wine tag. Here is another look at the tag on a wine bottle. Supplies: Unity Stamp Co. Wild Florals by Holly Hoffman, Derwent Inktense watercolor pencils, Papertrey Ink die, Pretty Pink Posh droplets, MSC patterned paper, Ranger watercolor paper and archival ink. Hello, it's Gaylynn. Today, we are sharing projects for the My Creative Time 78th Edition Release and blog hop. You should have arrived from Miss Emily's blog. If you get lost along the way, the entire blog hop lineup is on the My Creative Time blog. Sentiment: Thanks for saving the day! This is the kind of card that is great as a thank you. I really like the super hero icons and sentiments in this set. This one has a girl theme. ALSO, DON'T FORGET our sale starts RIGHT NOW in the My Creative Time Store. Use the code: APR2018 to receive a discount off your entire purchase! This sale applies to "IN-STOCK" items ONLY. This sale will end on Friday, April 27, 2018 @midnight PST. Here are the other projects that I made for the sneak peeks of this release. For more detail about them, see the sneak peek Day 1, Day 2 and Day 3 posts. Your next stop in the hop is Miss Jessica. If you get lost along the way, the entire hop lineup is on the My Creative Time blog. Hi, it's Gaylynn here with Day 3 of the MCT 78th Edition Sneak Peeks. I made a decorated favor bag for today's sneak. 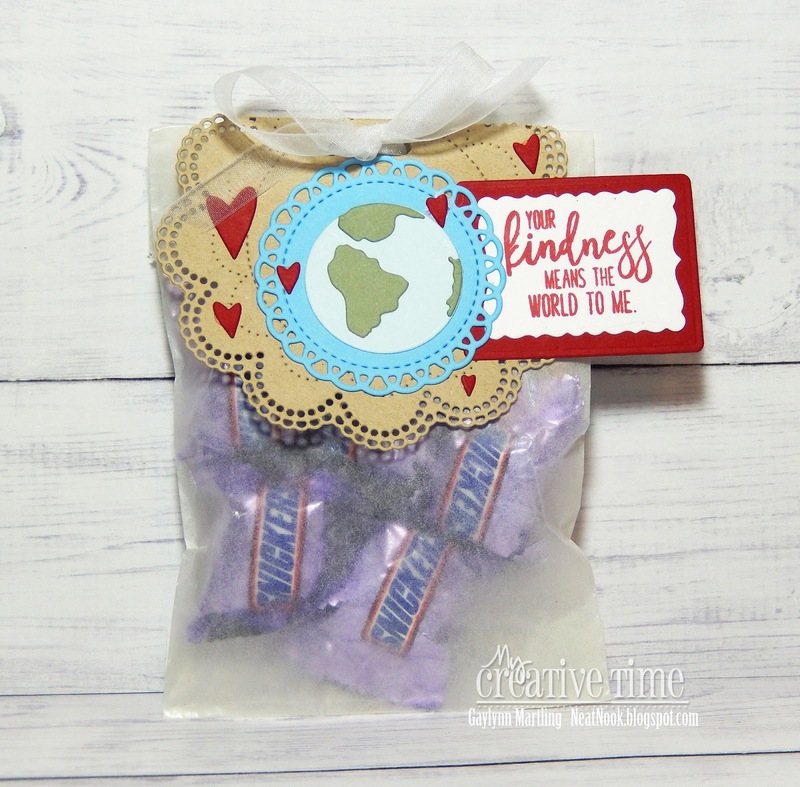 Sentiment: Your kindness means the world to me. 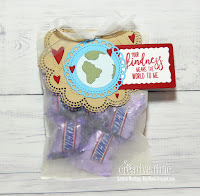 This is just one of the kindness sentiments in the kit and the world die is perfect with the stamps. Here is the favor bag a little closer. Remember to leave a comment for a MCT prize chance. And then head over to Miss Emma's My Creative Time blog for more sneak peeks. Graphic transparency watercolor handmade card. Today, I am sharing another Watercolor Wednesday project for Unity. 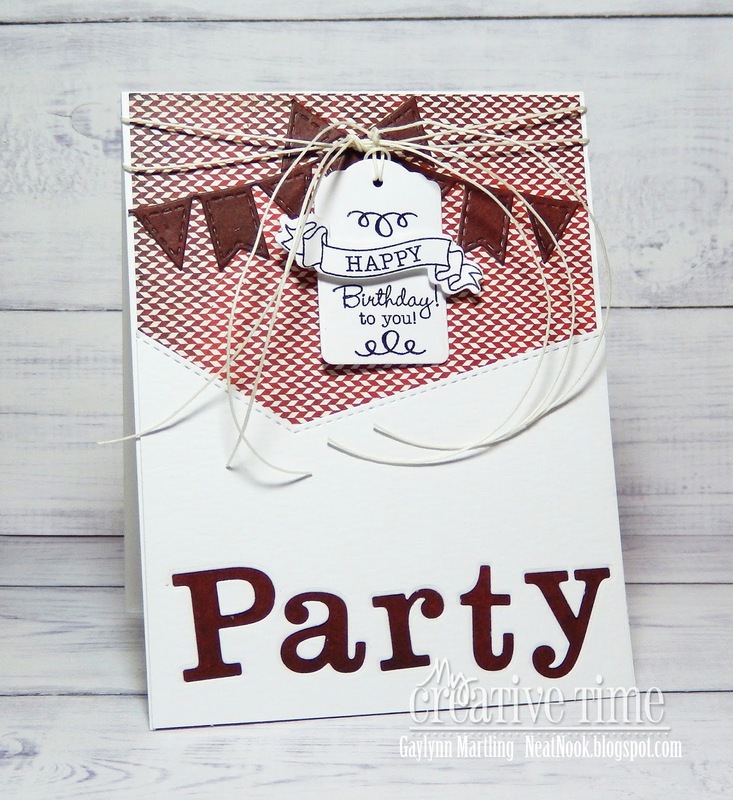 This time I am showing how to add trendy graphic transparency shapes along with stamping. Sentiment: It all happened here. For this card, I used stamping, clear embossing and Sakura Koi watercolors. For a trendy look, I added watercolor circle shapes, overlapping them with bright bold colors. This can be done with solid stamping, but I used watercolor for color in this example. Here is a quick video tutorial for this effect. Be sure to view the entire tutorial and article on the Unity Blog. For more of my Unity watercolor projects, visit Watercolor Wednesday. Hi, it's Gaylynn here with Day 2 of the MCT 78th Edition Sneak Peeks. I made a masculine style gift card holder for today. 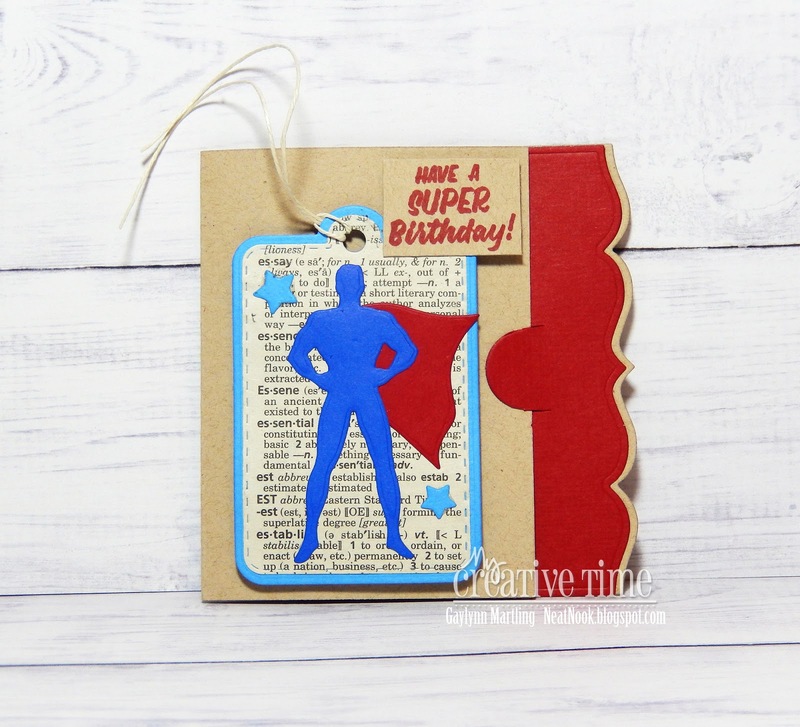 This kit includes super hero dies and sentiments. I needed a gift card holder for an upcoming birthday. This kit is perfect for masculine projects. Here is my card a little closer. Hi, it's Gaylynn here with Day 1 of the MCT 78th Edition Sneak Peeks. I made a cute pencil pun card for today. This card works for school, encouragement, birthday or just because. I love the cute pencil stamps and dies in this set. For this card, I used paper piecing instead of coloring in the pencil. I had fun with it. You can't tell from the photo, but the eraser trim is silver foil. It shines in person. Today, I am sharing a tropical pun card featuring a seahorse and watercolor bubble accents. Sentiment: I love when I get to sea you. For this card, I kept it bright and cheerful in bright blue and green. I used Copic markers for the seahorse. But, for the bubble accents, I die-cut from Brusho watercolor cardstock. This piece of watercolor was originally made as part of another project and was a leftover section. A wreath die was used, which includes all different sized dots. It was perfect for the bubbles and the cool colors. Here is a quick video tutorial showing the seahorse card process. There is a Unity blog hop happening now throughout the weekend. There are prizes up for grabs for those leaving comments on all of the design team member's blogs in the hop. Hop along with us at the Unity April blog hop. 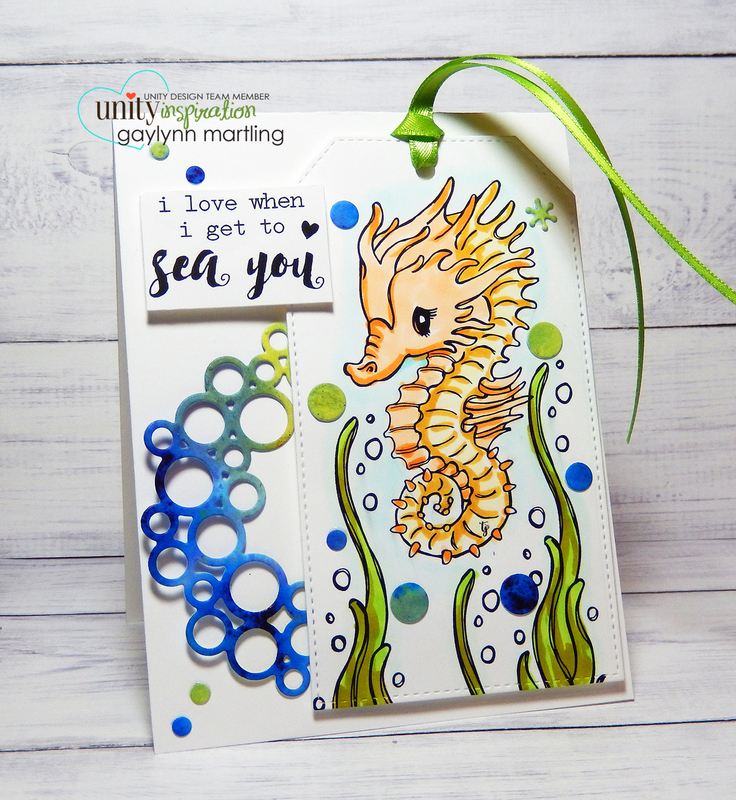 Supplies: Unity Stamp Co. Cuddlebug Sea Horse by Tierra Jackson, Copic markers B01, YR23, YG0000, YR0000, YR00, YR14, G0000, YG95, YG13; Lil' Inker Designs wreath die, MFT die-namics and Brusho Crystal Colors watercolor. 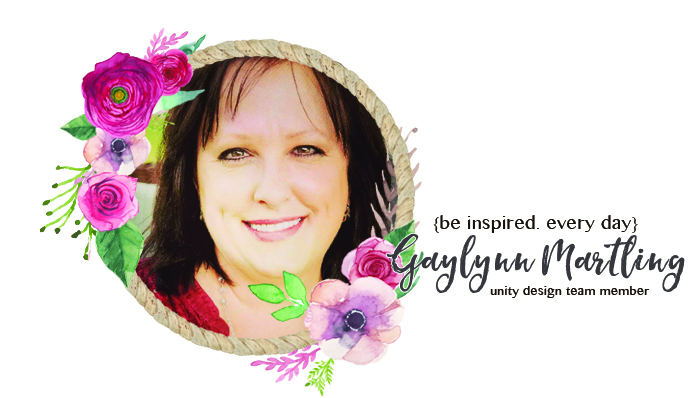 Hi there, it's Gaylynn here with a dream catcher handmade card for the Unity Stamp Co. blog hop. For this card, I stamped onto watercolor paper with waterproof ink and then masked the edges of the card front. I allowed portions of the stamped image to extend into the frame area. The dream catcher was lightly colored with Copic markers. I then added layers of distress oxide ink for the background. I lightly spritzed the card front with water. Removing the masking tape leaves a white frame look. For the top portion, I made a gold embossed sentiment topper on vellum. Finally, I finished with adhesive pearl accents. Here is a quick video tutorial for this dream catcher card. Here are the stamp kits used and they are linked further down in this post. Supplies: Unity Stamp Co. Stay Close To Your People April 2018 SMAK and Big Inspiration Big Words; vellum, MFT die-namics, Copic markers BG10, G0000; Ranger archival ink, distress oxide ink, distress embossing ink and watercolor paper; adhesive pearls, MSC copper embossing powder. This is another installment of my Watercolor Wednesday series on the Unity blog. I am sharing a way to watercolor with acrylic paint. This handmade card was heat embossed in gold and watercolor was added as a background. I used watered down acrylic paint as watercolor. Here is a quick video tutorial for this watercolor paint card. Be sure to visit the Unity blog for the full article and instructions. 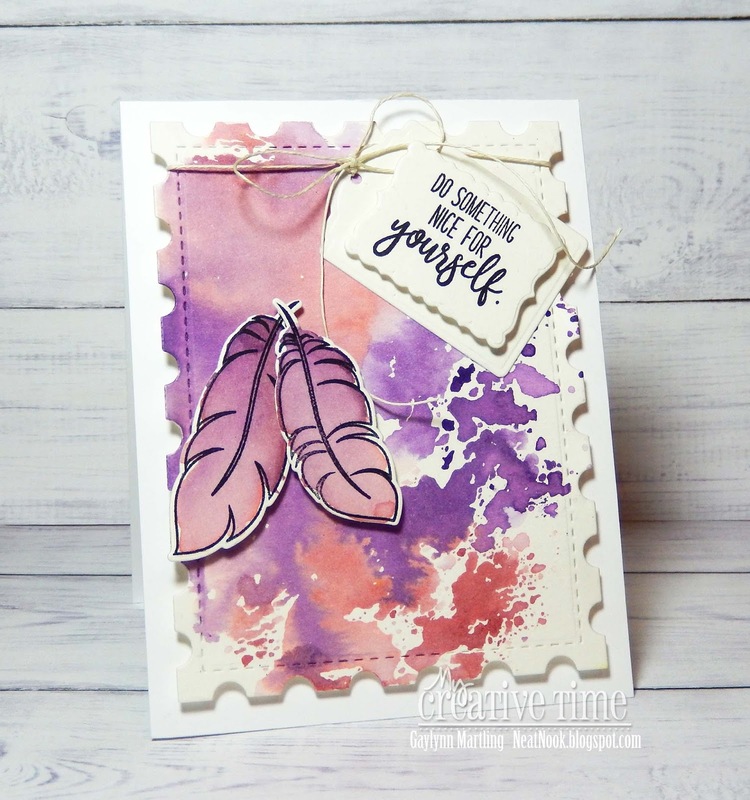 Supplies: Unity Stamp Co. Love Brings You Home; Ranger gold embossing powder, watercolor paper and embossing ink; Liquitex Basics acrylic paint; paper trimmer. Hi, it's Gaylynn with another project for My Creative Time's Whatever Wednesday. Sentiment: Fill your heart with love. Easter was the inspiration for this project. I felt inspired to create in my bible journal. 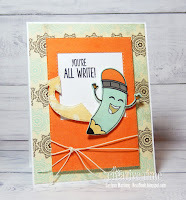 For this, I used MCT stamps and dies along with Prima chalk ink. For the thin bible pages, these inks stamp beautifully and they do not bleed through to the back side of the page. Hooray!!! I stamped the wreath, which to me symbolized the crown of thorns. Then I stamped the inspirational sentiment along with sprigs and tiny die-cut hearts. 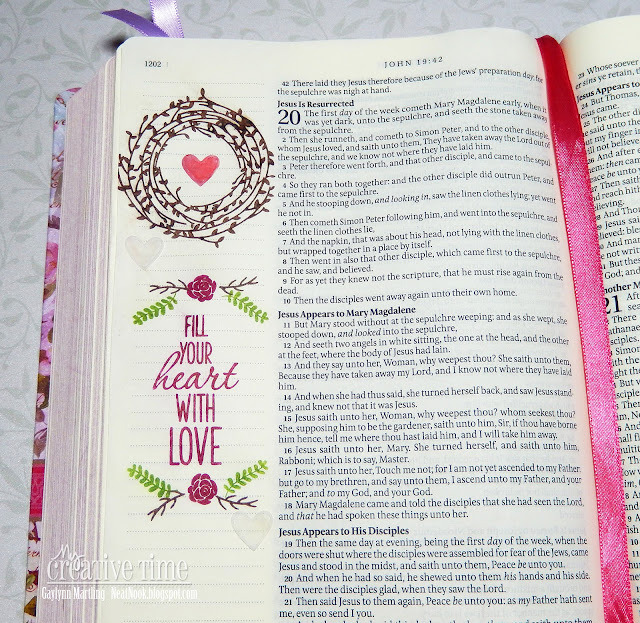 For more of my bible journal projects, see bible journal. I share different ways to add art to bible pages, using different methods, trial and error. Supplies: My Creative Time stamps and dies, My Creative Bible, Prima Chalk Edgers. Remember to visit Miss Emma's My Creative Time blog for more Whatever Wednesday projects. Stamping with water and distress oxide ink. Hi, it's Gaylynn with another project for Unity's Watercolor Wednesday. For this project, I used a water stamping technique along with distress oxide ink. The full tutorial and detail is on the Unity blog. Here is a quick video tutorial for my water stamping technique. Now, please go visit the Unity blog for the full article. Supplies: Unity Stamp Co. You Are Important, Ranger distress oxide ink and archival ink, Pretty Pink Posh sequins, MFT die-namics and Canson watercolor paper. Feel free to leave a comment here. I would love to hear what you think of today's project. Hello, it's Gaylynn. Did you know that April 3, 2018 is World Party Day? This is a card for the MCT weird holiday projects, today. A birthday is a perfect party occasion. Sentiment: Happy birthday to you. Party. Since it is World Party Day, I emphasized the "party" for this birthday party card. It is fitting for a guy or gal. I used lots of leftover paper and accent pieces for this. I tucked a plum paper strip behind the "party" and die-cut the garland from the same paper. Then, I stamped and die-cut the tag with excess paper. The red and white paper was also leftover. I cut it to fit the top portion of the card. The bottom piece is a leftover section of a panel previously used. Here is a closer look at this party card. Be sure to stop by Miss Emma's My Creative Time blog for more weird holiday projects.